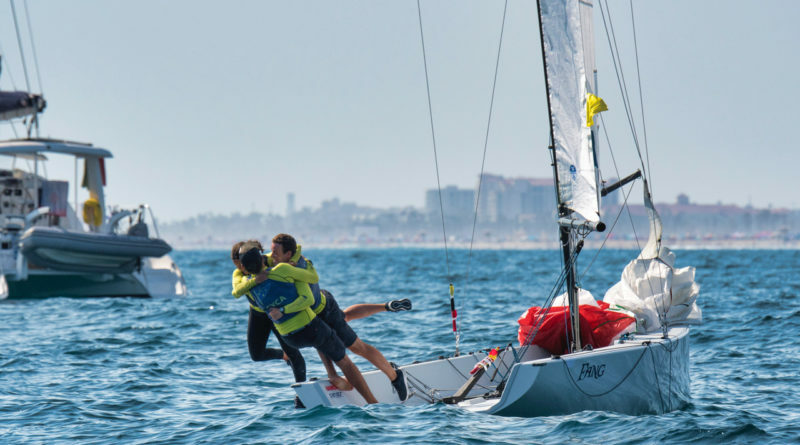 NEWPORT BEACH, CA – In a close-fought final on Aug. 5, Harry Price (Australia) and Ettore Botticini (Italy) traded jabs throughout the best-of-five-race series, with Price coming from behind to win the Youth Match Racing World Championships at Balboa Yacht Club in Newport Beach, 3-2. With excellent pre-starts and classic match race tactics, Botticini went up 2-1 – stunning the many Australian fans cheering for Price from spectator boats and on Balboa YC’s live stream TV feed. Botticini was not without fans – a large contingent back home in Italy had been closely following their country’s new match racing hero all week on social media and in the Italian yachting media. Despite being down 2-1 with Botticini on match point, Price and his team from Sydney’s Cruising Yacht Club of Australia remained cool, sailing a brilliant fourth race – a must win – that saw them lead from start to finish, evening the series at 2-2. In the fifth and final match, Botticini made an unforced error at the start that ultimately cost them the championship. During the pre-start, the two teams jockeyed for position aggressively, reaching the starting line early. At the starting signal both teams were clearly over the starting line early, and were signaled by the race committee to return to restart. Each dipped back across the starting line, but Botticini turned up the course before getting his boat completely back to the pre-start side of the line, requiring a second return. In the meantime, Price cleared himself and was up the course with a five boat-length lead that he never relinquished. Price, as the #6 ranked match racer in the world (of any age), was the pre-regatta favorite, and his team won the preliminary phase – losing only two matches of the 22 in the double round robin held Tuesday through Thursday. But one of those losses was to Botticini late in Round Robin 2, setting up the tense final. Price had won his semifinal over the USA’s Greiner Hobbs (Tampa, FL) 3-0, while Botticini took four matches to dispatch George Anyon of New Zealand 3-1. In the best-of-three petit final (consolation series between the other semifinalists), Anyon defeated Hobbs 2-1 to finish third overall. (Australia) and Ettore Botticini (Italy) traded jabs throughout the best-of-five-race series, with Price coming from behind to win the Youth Match Racing Worlds at Balboa Yacht Club in Newport Beach, 3-2.